An enthusiast who enjoys having photography as an excuse to get out in to the wilds. The introduction of the A7R introduced the tempting concept of a specialist small high MP camera for landscape enthusiasts. As we discussed in the initial review it delivers on quality and portability but with a paucity of lenses to make it a totally compelling purchase. The Zeiss 35mm and 55m lens introduced with the camera certainly get the best that the sensor can deliver. Both Andrew and I have the 35mm lens, Andrew has the 55mm lens and both are almost clinically sharp across the frame. There are typically 2 ways to get increased wideangle options – buy a native wideangle lens (doh !) or put in place a workflow to stitch multiple images either via a shift lens or a panoramic adapter. The big problem remains for the landscaper that there are no native non adapted solutions for the ‘E’ mount currently available. Along with many others searching for usable wideangle options for the camera I have found that it is fraught with compromises especially looking at short focus designs from Leica, Voigtlander and Zeiss. With vignetting, purple corners and smearing I have not found or seen a viable lens wider than 35mm for colour landscape use from this stable. Zeiss have announced they are redesigning the biogon based wideangle lenses for use on modern short focus mirrorless cameras. How much has been achieved with the ZE 35mm in software in camera remains to be seen. Of the legacy brands that don’t have current digital bodies with the same mount (Nikon, Pentax, Minolta AF ) some interesting options are available at relatively bargain costs. Of the large scale manufacturers Canon FD glass stands out as being good value and widely available. Olympus OM is good but less readily available and commands a premium as does Leica R. Contax/Yashica has always been good but now quite difficult to buy and also getting to be in Leica R price territory. For example, a good Canon FD 28mm lens will cost around £30.00 secondhand whereas the equivalent Leica R or Contax will be 10x that. Nikon, Olympus, Pentax in between. 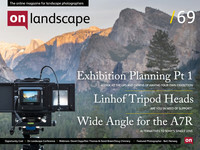 Of all the problems facing the landscape photographer management of depth of field is one of the inherent challenges. Even with the use of hyperfocal distance the modern high density sensors really show the transition to OOF quite brutally. Many turn to tilt/shift lenses to provide some of the flexibility to manage it in camera. Others use focus stacking extensively (see the David Clapp article on Focus Stacking). To date there are no native Tilt/shift lenses available for mirrorless so adapted solutions are required (a 24mm Samyang is scheduled for release this year in ‘e’ mount). For APS-C and smaller the tilt/shift adapters (look at Kipon) are a good solution and lenses designed for 35mm full frame provide enough coverage to have some tilt and shift available. Full frame effectively needs a lens with medium format coverage and the adapted solutions are not available for the ‘e’ mount for any of the medium format mounts (let alone those that might make sense). Modern Tilt shift lenses are available from Canon, Nikon, Schneider and Samyang but tend to be quite large and very expensive even before you add the adapter. Shift only legacy lenses are available from Pentax (28mm behemoth with built-in filters), Olympus (24mm & 35mm, very nice) and Nikon (28mm and 35mm). Pricing wise, the lenses with the exception of the Olympus 24mm have recently sold in the £300-£450 range, the Olympus 24mm significantly more. Compared to the cheapest modern lens will be £650+. As such they represent good value. As today they represented the premium end of the manufacturers lens range and have high quality build and optics. We will cover a wider range of Canon FD glass in a future article but in this article I will concentrate on the 20mm and 35mm TS lenses in Canon FD mount. Why these two ? One of the reasons for moving to the A7R is portability... a combination of a 20mm and 35mm TS lens is quite a flexible combination. The 35mm lens fully shifted in the landscape mode gives a panorama (2:1) very close to 20mm. Shifted fully in the portrait orientation likewise is very close 28mm but approximating to 4:3. It takes 72mm filters so an RF75 / Sev5n system from Lee fits it. Things of note - the 35mm TS is very compact even with the adapter on the A7R. It takes 58mm filters so an RF75 / Sev5n system from Lee fits it. The vernier scale for shift has a red area... for good reason – quality can fall off quite quickly and although a theoretical 11755 pixels is available from stitching panoramically I have found circa 10000 is usable. How do the results compare ? Almost inevitably without being able to alter the focal plane the infinity can be seen to be a bit OOF. The use of a bit of tilt brings foreground and background into focus with the 35mm T & S.
What it shows from these 2 images is the level of detail you can get from the A7R but above all how good some premium lenses are from the early 70s. I talked about the need to defringe some images at the extremes of shift or tilt, here is an example of a 5 frame stitch panoramically with before and after correction. This is full frames 11755 pixels and should be cropped to circa 10000 to be critically usable. Lastly some differences between the Canon 35mm TS in 'normal' mode and the 35mm Zeiss.